n 1 a: Geometrically patterned cloth traditionally woven from raffia-tree leaves by the Kuba people of the Democratic Republic of the Congo. b: Naturally colored fabric created through a labor-intensive process of hand-dyeing using mud, indigo, or the powdered bark of the camwood tree. 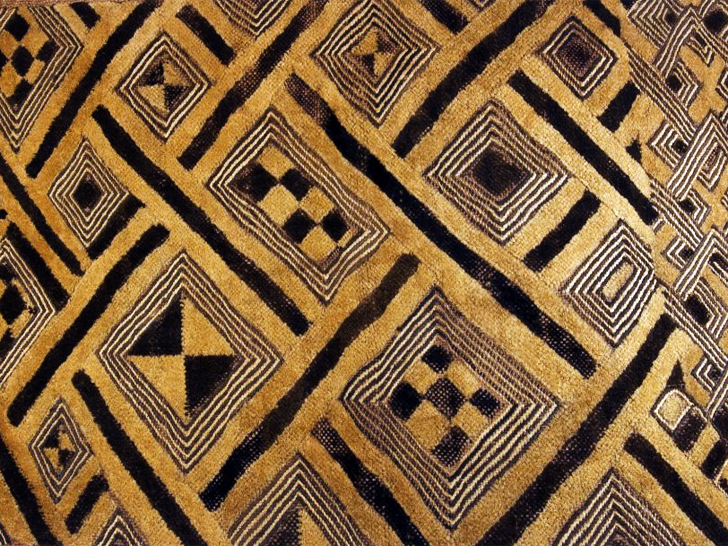 c: Typically created by Kuba men on a single heddle loom, then embroidered by women and children to create an uncut or cut-pile appearance (the latter resembles velvet or velour). 2: a Traditionally worn during ceremonial events, primarily funerals, but also found in tapestries and home goods. b: Includes symbolic patterns that indicate a person’s social and marital status, age, and even attributes of a person’s character.